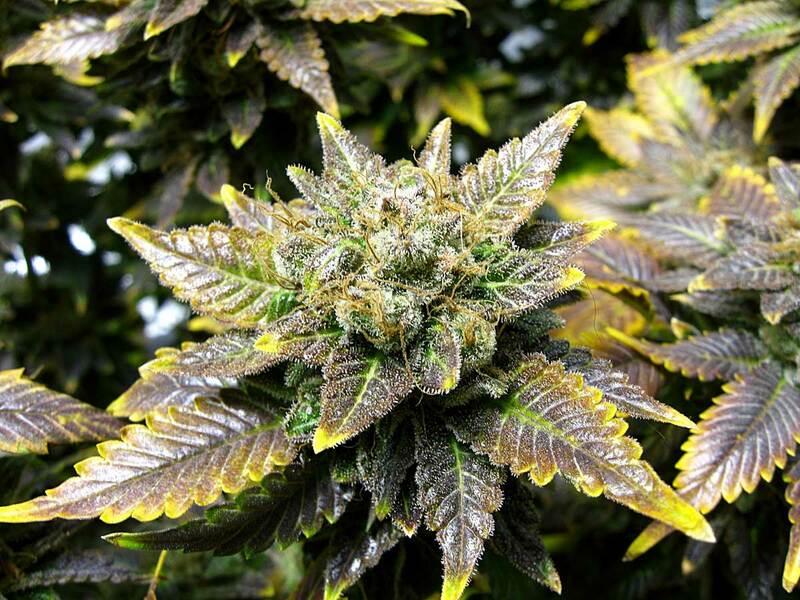 Problem: A cannabis copper deficiency appears with leaf symptoms such as dark leaves that take on blue or even purple undertones. The tips and edges of leaves turn pale yellow or white in stark contrast to the rest of the leaves which have turned dark. In flowering it's important to correct a cannabis copper deficiency as soon as possible because buds may stop maturing if the plant isn't fixed up right away. 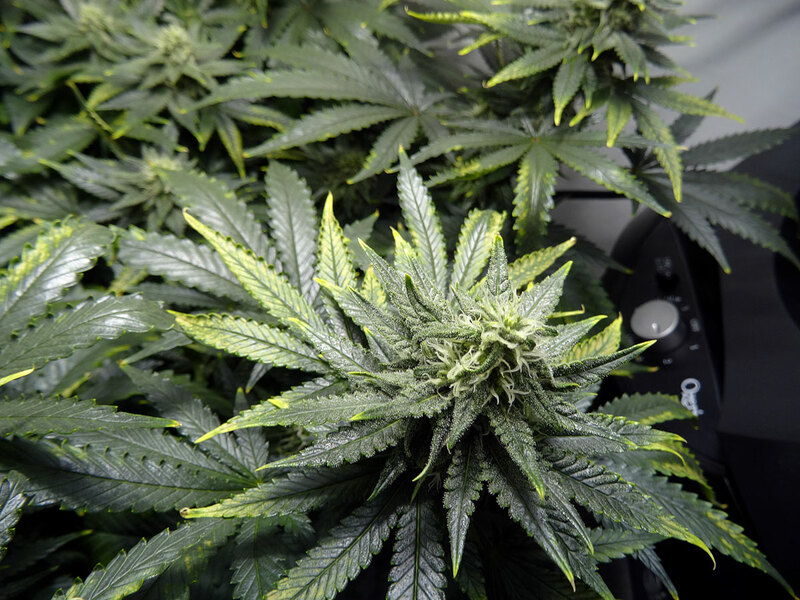 Copper doesn't move easily through the plant and is considered "low-mobile" which means the yellowing leaves might not necessarily turn green again, but the problem should stop spreading to new marijuana leaves. The pale tips of a cannabis copper deficiency look a little different from nutrient burn, which may start out with slighly yellow tips, but soon makes tips appear brown or burnt. This is what the yellow leaf tips of a cannabis copper deficiency looks like. The most telling feature of a copper deficiency is that the rest of the leaf darkens and takes on a blue or purple cast which makes the yellow tips look bright in comparison. The leaves also often appear shiny and may feel stiff. Some strains are prone to copper deficiencies in the flowering stage, which can create dark purple or reddish hues in the leaves directly under the lights. The following picture shows a Blue Widow plant where all the leaves under the light turned purple due to too-bright light and incorrect pH triggering a copper deficiency. 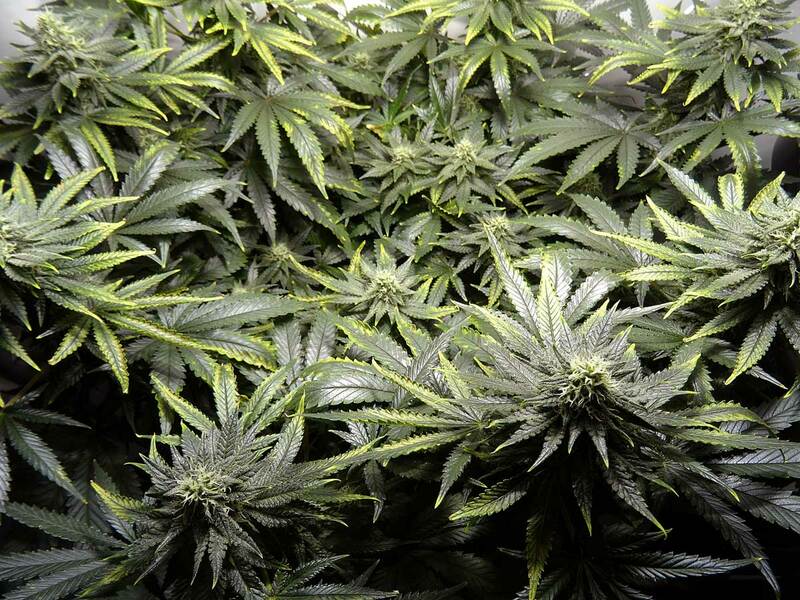 A cannabis copper deficiency tends to affect the leaves directly under the light. If your grow light is close it may help to move lights a little further away. A big problem with a major copper deficiency if it happens early in the flowering stage, is the affected leaves are not good at photosynthesis and won't provide nearly as much energy for the buds as they would if they were green. It's important to keep leaves near the buds healthy during the majority of the flowering stage to help ensure you get the best yields possible. While it's normal for leaves to start dying in the last week or two before harvest, you should react quickly if you're seeing unhealthy leaves earlier than that! It is very unlikely that there is no copper available in your water or soil, so usually a copper deficiency in cannabis is caused by a pH problem at the roots that is restricting access to nutrients. Copper toxicity (too much copper) in cannabis plants is rare, though a severe case of too much copper can cause a quick death to the plant. The most common reason growers will see copper marijuana deficiencies is when the pH at the roots is not in the correct range. Copper tends to get locked at certain pH levels, and is better absorbed by the plant in a slightly acidic root environment. If you suspect your growing cannabis plant has a copper deficiency due to incorrect pH, flush your system with clean, pH'd water that contains a regular dose of cannabis-friendly nutrients. This will remove any nutrient salts that may be affected the uptake of copper and help restore pH to the proper levels..
Watch to make sure that the problem starts to clear up within a couple of days. Old growth may not recover, but new growth should be healthy. The truth is, most cannabis growers don't need to add more copper in response to a copper deficiency! In fact, most growers have actually already given plenty of copper to their cannabis plants since it is found abundantly in most tap water. If you're using quality soil or cannabis-friendly nutrients, you probably don't need to worry about adding more copper. In general, copper deficiencies are more likely to appear when a grower is using heavily filtered or reverse osmisis (RO) water to feed plants since any copper has been removed, but pH is a much more common reason growers see copper deficiencies in their cannabis plants. After going through all the above steps, watch to make sure that the copper deficiency starts to clear up within a few days to a week or so. The damaged leaves may not completely recover all their green, but you know you're in the clear when you stop seeing symptoms appearing on new leaves. If you cannot get rid of a cannabis copper deficiency, please consult our 7-Step Cure to 99% of Cannabis Growing Problems with chart!